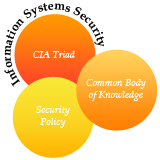 The CISSP curriculum covers subject matter in a variety of Information Security topics. The CISSP examination is based on what ISC2 terms the Common Body of Knowledge (CBK) which is a collection of topics relevant to information security professionals around the world. The CISSP CBK establishes a common framework of information security terms and principles that allow information security professionals worldwide to discuss debate and resolve matters pertaining to the profession with a common understanding. People are the key to a secure organization. Technological solutions alone cannot protect an organization's critical information assets. Employers demanding qualified information security staff give their organizations a leading edge by providing the highest standard of security for their customers, employees, stakeholders and organizational information assets. The CISSP certification identifies individuals as security experts who have the technical ability, understanding and experience to implement effective security practices. This workshop is meant for professionals responsible for the security of the organization’s information systems and assets. The CBK® (Common Body of Knowledge) establishes a common framework for information security management consisting of 10 security domains outlined below which are covered during our workshop. Each domain has a set of review questions followed by a mock exam on completion of the workshop.